Abbott Fay's long awaited sequel to our best-selling book, I Never Knew That About Colorado, has finally arrived! 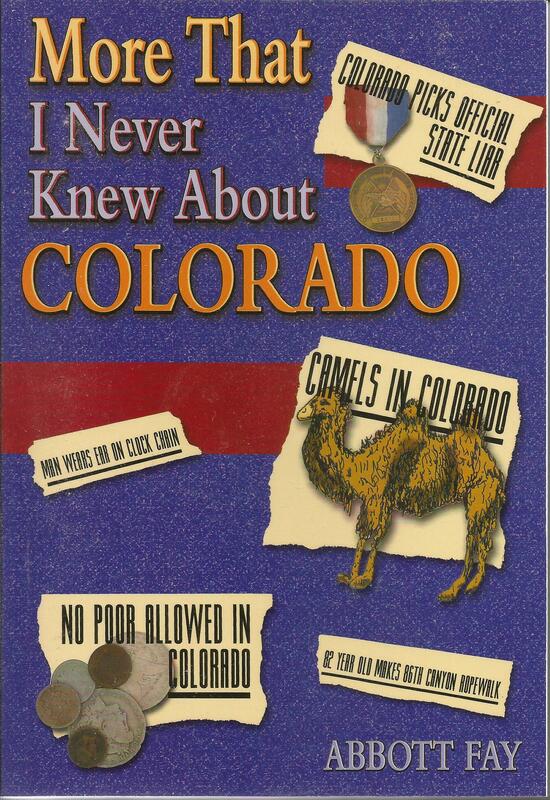 This book is filled with unique places and unusual facts about Colorado: Who was the official Colorado State Liar? What future movie star stole a locomotive in Golden? How did the naughty nymphs shock Denver? Did Tom Mix mix Tom Collins in Lamar? Where do rare butterflies breed in Colorado? Did Colorado reporters start the Boxer Rebellion in China? A big herd of bachelor bulls; Denver's pigeon man; Rattlesnake Jack; underground bread-baking, and a hundred other forgotten places and interesting events are included in this fascinating book. If you ever thought that history was dull, then glance inside these covers for a surprise! For over five decades Abbott Fay has been dedicated to the vibrant history of Colorado. He has written seven books, hundreds of articles, and is a sought-after speaker and tour guide. He is an adjunct professor of history at three Colorado colleges. His unique ability to search out little known facts about Colorado always keeps the reader spellbound.